Cook bacon and drain. 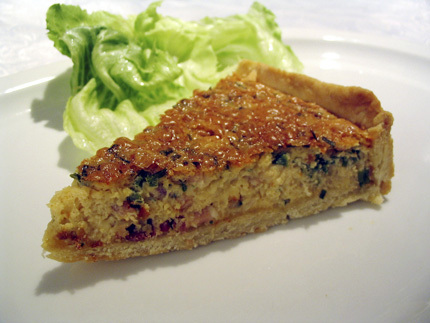 Sprinkle cheese and bacon into pie crust. In medium bowl, beat eggs, Steve's Pepper Sauce, chopped spinach, half and half, salt and nutmeg with fork. Pour into pie crust. Bake at 425 degrees for 15 minutes. Turn oven down to 325 degrees and bake until set (20 minutes or so). Serves 6.